Our stay at Paynes Prairie Preserve State Park was pleasant. So nice in fact that we decided to stay there two more times before our first Camp Hosting assignment. On our first visit in January, we discovered that we could actually get one or two TV stations from Gainesville with just our antennae and the internet service was pretty good between 2 to 4 bars depending. 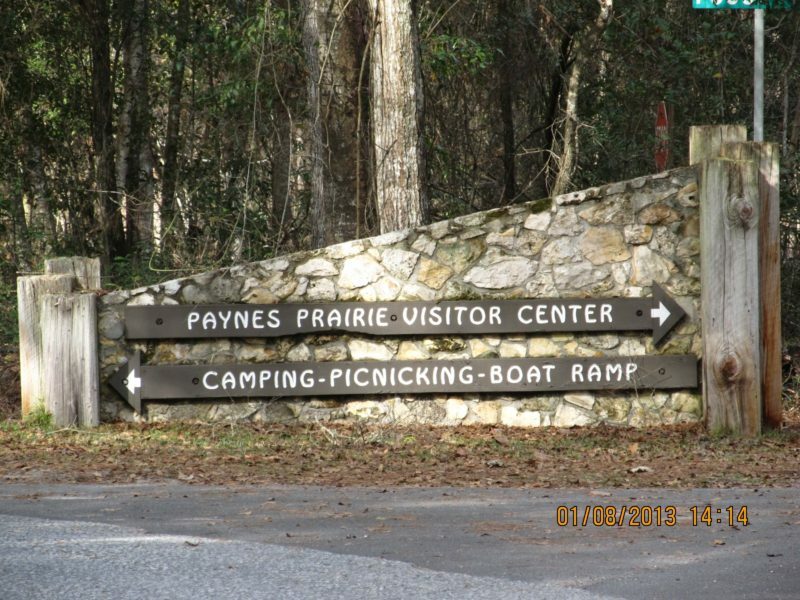 There are literally miles of trails to hike or bike down, there is the prairie to view from several spots within the main park as well as from U.S. 441. We didn’t get a chance to climb the Tower near the visitor’s center on our first visit but were told by the volunteer that if you get up early enough in the morning, campers can go almost any time, and climb the tower you just might see the buffalo, wild horses and various other wildlife that call the prairie home. She explained that there are approximately 40 or 50 buffalo left in the park and quite a few wild horses as well. You cannot swim in the park and the only fishing seems to be from a boat, canoe or kayak that you can put in on the lake from the boat launch in the day use area. Across the lake you can see a swimming area with little paddle boats, canoes, etc. but we found out that those are strictly for the University of Florida students, staff and alumni that have passes. While we were there the squirrels decided that our RV and minivan might be an excellent winter abode. We encourage anyone who is staying in the campground to check your vehicles thoroughly before starting them up to make sure you don’t get a hitchhiker or two. One of them, unfortunately, decided to crack some acorns on our battery and we heard a little squeak when we started the car. I couldn’t find him or her inside in the engine and hope we only got a portion of their tail. On our second visit, I was checking the oil when I noticed a clump of leaves, twigs and stuff matted up against the battery and radiator. No animal visitors inside the clump but we had to clean that up as well. The campground is very nice, a little cramped at some of the sites as they try to fit in everyone cheek to jowl but most of them have trees and bushes separating the sites from one another. They have a fire pit, picnic table, and lantern pole at each site along with water and electricity. Some of the sites have additional tent pads but there is a designated tent only camping area near the back of the camping area. This park has two large bathhouses to accommodate everyone with three showers, three bathroom stalls, and three sinks. They also have a long bench inside the bathhouse in case you have to wait your turn to use the showers or stalls. The water is hot and plentiful. The bathrooms are always clean but there is no heat or air conditioning. Although both bathhouses have ADA showers they both need repairs or replacements. One shower seat is going bad and in the other house, the seat has been taken out. It is very dark in the camping area so if you need to use the facilities after dark make sure you bring along a flashlight. Campers can access the children’s playground and the amphitheater down a sidewalk in the back of the camping area. The day use areas have lots of parking, picnic tables, and their own bathroom as well. The visitors center is all the way in the back of the park and you have to go down a long sidewalk to get to it as well. During our first visit, they were working on the sidewalks leading into the center and were detoured around down a winding trail. The visitors center is open during the day and is FREE to browse around the many interesting displays. There is an observation deck on the second floor but it is difficult to see the prairie area from there for all the trees. When we left the center we decided to take the sidewalk back because we were told that there was an eagle’s nest just up from there. We saw the eagles soaring in the sky and you cannot miss the nest it was huge sitting on top of a very large pine tree. There is another bathroom with picnic tables a little way down the sidewalk and more trails behind. We were too tired to try them out that day. There are no laundry facilities in the park. You have to go to Gainesville to find most of what you need including, coin laundries, better gas prices, grocery stores, etc. Just head north on U.S. 441. We ventured out several times into Gainesville and almost every time, especially close to sunset you will find people parked along both sides of the road looking out onto the prairie. There is an observation deck as well. But what struck us as a little strange was the number of musicians out there. One time there was a young girl with a guitar singing, the sun going down behind her and her companions filming while she did. Another time we saw a young man with a set of drums just playing next to the road. I don’t know if they are there for the acoustics or the backdrop. $30.00 plus tax – Picnic pavilion seats 65 people. $18.00 per night, plus tax. Includes water and electricity. Florida residents who are 65 years of age or older or who hold a social security disability award certificate or a 100 percent disability award certificate from the Federal Government are permitted to receive a 50 percent discount on current base campsite fees (Proof of eligibility). $4.00 per person, plus tax (minimum of $20.00 per night). Too many to list in Gainesville. Just Head North on US 441 into Gainesville and just about any restaurant you want can be found.